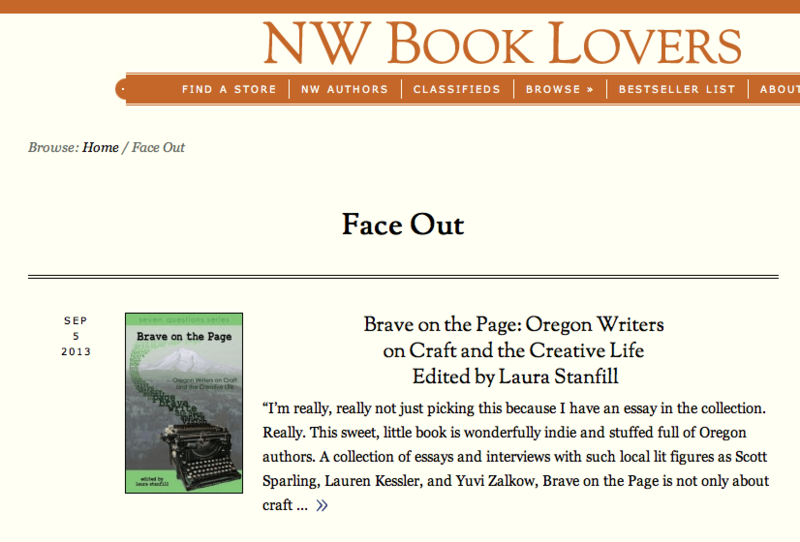 In the midst of all the wonderful pre-release hubbub this week, the Pacific Northwest Booksellers Association posted a “Face Out” about Forest Avenue Press’ first release, Brave on the Page: Oregon Writers on Craft and the Creative Life. We didn’t know about the PNBA and all the great things they do until doing pre-publication research for A Simplified Map of the Real World, Stevan Allred’s book forthcoming next Thursday. We’re excited to announce that Stevan has been invited to the PNBA fall tradeshow to speak at the Celebration of Authors, a luncheon that recognizes ten debut Northwest authors. This year’s other Celebration of Authors invitees, in addition to Stevan, are: Karen Spears Zacharias, Brian Payton, Chelsea Pitcher, Kevin Sampsell, Stacy Bolt, Rosamund Hodge, Don Waters, Jill Malone, and Bryce Andrews. And stay tuned for a feature in NW Book Lovers featuring Robin Cody, author of Ricochet River, interviewing Stevan Allred on Sept. 10.